So Lark may not be the one-of-a-kind regional destination it once was. But there is now significant competition in the commercial category of "hip urban areas" precisely because it has something the rest of the region lacks -- that urbanity. What makes Lark -- and yes, other regional downtowns as well -- feel different, what gives them a niche and puts them in competition with each other in addition to (instead of?) suburban strip malls is the feeling of being part of a city. It follows, then, that Lark's task is to enhance that feeling of urbanity -- to not just be the hip urban area, but to be the best urban commercial area. Because it always comes back to this. One of the most common comments in AOA's Lark interviews was that parking is a challenge. However, as I've written on my personal blog, the issue with parking in the Center Square/Lark area isn't so much that there's not enough as that the existing supply is exceptionally poorly managed. Land devoted parking is deadly to street life in an area that thrives on urbanity; it actively detracts from the urban feeling, and by attracting more car traffic, puts pedestrians -- the lifeblood of any walkable commercial area -- at risk. So the challenge for Lark is to find ways to better utilize existing parking infrastructure rather than adding. A unified parking map showing available public and private parking, on and off street, would be a great start. Government, or the BID, or SOMEONE must also take a more active role in persuading the several local private lot and garage owners who together control 500-600 spots to advertise their services to Lark-goers. Surely, some central broker can work out a deal to standardize pay parking rates across the neighborhood; correctly regulating parking pricing (including pricing formerly free spots) is a key strategy for any area with a claim to be urban. Sure, Lark ranks among the most walkable and pedestrian-friendly areas of Albany, and indeed the whole Capital Region. But it's far from perfect. It's easy to forget given this incredibly mild winter, but Lark is an obstacle course when there's snow and ice on the ground. Property owners need to understand that not clearing snow is not only illegal and unethical, but is actually detracting from their ability to do business. Several local intersections -- especially the complex, busy ones at Lark/Madison/Delaware and Lark/Washington- -- could benefit from some pedestrian-considerate design treatment. I was somewhat disturbed to see comments in AOA's previous piece -- both from interviewees and in the comment section -- that spoke in nasty terms about various kinds of undesirables who the speaker understood as detracting from Lark's appeal. Unfortunately, similar feelings emerged during the recent controversy over the bus stop CDTA wanted to locate in front of Iron Gate CafÃ© (to be clear: Iron Gate's owners took the high road and made it clear they would not engage in that kind of rhetoric, but the comments made online and at meetings did not reflect that level of principle). Look: diversity is an intractable part of urbanity. Trying to sanitize the diversity out of the crowd that takes advantage of Lark's commercial offerings and walkability every day can only hurt the neighborhood's economic prospects. A Lark that feels sanitized is a Lark that can't compete with suburban shopping malls because it replicates their trademark feel rather than valuing the authenticity of urban life. One of the most common threads in dialogue about Lark's future -- among AOA interviewees, in the comment section, and on the Hudson/Park listserv, which I subscribe to -- is people expressing their desires about wanting to bring specific kinds of stores or businesses to Lark. I get it. Like others, I'd love to see a Stewart's in the former Ben & Jerry's space. And as a vegetarian and a faux meat aficionado, I was hugely excited to hear Berben & Wolff's plans. But I can't help but feel that the effort to get just the right mix of commercial concerns on Lark is the wrong approach. Like many planners and urbanists, I owe some of my insights into this dynamic to Jane Jacobs. She is often celebrated as a preservationist, but Jacobs had a quasi-libertarian bent when it came to urban economies. One of her key insights was that urban economies are inherently, desirably, messy and "inefficient" (that is, involving frequent turnover of businesses). Indeed, Jacobs delighted in pointing out the inevitable failure of attempts to manage "efficient" economies that would be stable and prevent firm failure. Part of the malaise affecting Lark is simply the messiness typical to any urban economy; businesses on Lark have opened and closed not just because of "the economy" but because of things particular to that business such as management, space issues, or a simple desire to change the business model. The corollary to Jacobs' principle of inefficient urban economies is that rather than trying to establish and preserve a particular mix of businesses, planners and other stakeholders need to work on creating the best possible underlying fundamentals to allow businesses to rise and fall in a healthy manner while maintaining a neighborhood's economic vitality. Basics such as infrastructure, mobility, and zoning will go a lot further in the long term than anything else. 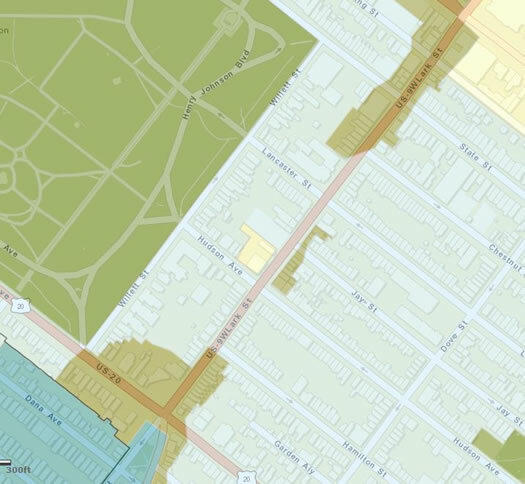 Zoning map of the Lark Street area, from Albany's GIS zoning map. R-2C (Multi-Family Medium Density Residential District) zones in blue, C-1 (Neighborhood Commercial District) in olive green, C-0 (Commercial Office District) in yellow. Take, for example, zoning. Currently, Lark Street is covered by several different use zones. Those differentiations reflect a suburban-style understanding of separated land use that doesn't logically apply to Lark, with its richness of multiple-use buildings. 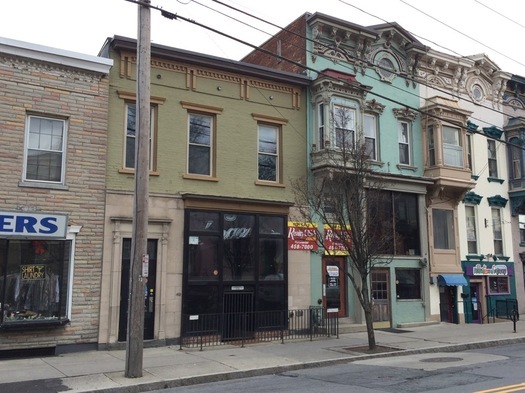 Luckily, Albany's zoning is in the process of being changed. Hopefully, the ReZone Albany process -- which is moving toward implementing form-based codes (focused on shape and feel rather than use) in several areas -- can bring something like that, or at least a consistent, mixed-use zone--to Lark. If the area is to embrace the urbanity that has made it successful, it needs a framework that enables that, rather than holding it back. So that's my call to the BID, to the neighborhood organizations, to other business owners: let's focus on the fundamentals. Make Lark a place we can all be proud of in the long term. Lark should be closed from Madison to State and replace it with greenery, a fountain, outdoor seating and a small playground. "Extend" Washington Park into a commercial area. Make it rival Church St in Burlington to encourage true pedestrian traffic. There's never going to be enough parking on that street proper, so why fight it? Give residents a beautiful front yard, give business gorgeous outdoor cafe seating. Iâ€™m glad others have pointed this out, but improving the walkability of this corridor and promoting a culture of walkability is critical. Parking isnâ€™t as big of an issue if youâ€™re willing to walk a few blocks. Lark St, nor downtown Albany for that matter, is ever going to be the mall, even if you pop in a parking garage somewhere on this corridor, some suburbanite will complain that it was placed too inconveniently from this and that (e.g. look at downtown, parking garages half empty on busy nights, because folks donâ€™t want to walk half a mile to their destination, but irrationally will walk a tenth of a mile from the parking lot to the mall and then walk potential miles within). I think a more concerted effort between residents, businesses, and the city to clean up the streets, provide a beat cop at all times of the day, and really improve the pedestrian infrastructure (e.g. the Washington Ave and Lark intersection should allow dedicated pedestrian right-of-way during the lighting cycle, not a token â€œwhite walking guyâ€ while cars are simultaneously given a green arrow, because they will view that as giving them the prerogative over the pedestrian) can all go a long way. I also believe that the community itself often sabotages a lot of its own real and potential success. What should be a diverse, lively corridor is often shackled by suburban NIMBYism. In terms of walkability, the recent, ill-advised campaign over the pedestrian safety upgrades and new bus stop alignment on Washington Avenue does not portend that the community gets it. This proposal offered excellent upgrades to pedestrians and transit users alike, which were all discounted or scapegoated to carry water for the communityâ€™s opposition to a little bus stop in front of Iron Gate CafÃ©. The campaign, claiming the changes would make the corridor less safe, couldnâ€™t even point to alternatives (maybe because the proposed changes were pretty good!!). As a frequent transit user who lives elsewhere in the city, I enjoy my bus ride to Lark to shop and recreate, however, the negative, prejudicial and ill-informed comments by the community over the proposed overhaul of this intersection really turned me off, so much so, that for a while I refuse to patron Lark if they didnâ€™t want to value my contribution as an â€œoutsider.â€ Additionally, some of the unique, creative events that could happen on Lark (e.g. remember the burlesque show, bullied into cancellation via the nascent Cabaret License changes in Jenningsâ€™s final stretch) have been shot down by friendly fire within the community, who sometimes take a quiet, pastoral city street for residents too far at the expense of some exciting opportunities to draw in those â€œoutsidersâ€ and improve the recreational opportunities for those who live within this corridor. Lark St BID, City of Albany, as a resident of the neighborhood, please never close it from Madison to State and replace it with "greenery." Washington Park is a block away and this is an urban neighborhood, and should remain so. In fact, closing a numbered state route and diverting these cars down Dove would ruin the rest of the neighborhood as completely as turning an urban street into an unnecessary park. As Sandy says, there's plenty of available and unused parking. Manage that instead of worry about more spaces. There needs to be better management of the parking, but there also needs to be an increase in parking options. If traffic can be efficiently rerouted, Abby is correct: close it down. But also build a huge public, free parking garage right near the street once you close it. I avoid going to businesses on Lark like the PLAGUE because I can't park there... It's a nightmare. Abby cities have tried pedestrian malls in the past. The city of Buffalo did that in an effort to keep it's Main Street alive, and they're no in the process of turning it back into a cars-sharing-traffic with the trolly model (spending millions of $$$ to do it in the process). The street will be deserted, with no car traffic, or people walking to and from their cars the place will feel dead. We already have empire state plaza as an example. As a Lark Street resident, the parking section of this article is insanely inaccurate. Lark Street's parking problem is the lack of accessibility, especially for residents (not area people as I suspect the author is, I'm talking about actual Lark residents). The current system is revenue collection based, and everyone that lives here has to fight for parking post-5pm. You know what would make said problem worse? The next part of your article suggesting making it "pedestrian friendly". Ask Mayor Bloomberg in NYC how his pedestrian plaza plans have worked. (Hint: it's a nightmare). Ped-friendly streets means making it harder or less accessible to cars, something the author admits. Making it harder to access makes businesses run away. Wrong, backwards solution. Lark needs business incentives, better parking with more accessibility, and to rid themselves of the homeless/beggar issue that plagues it. A CVS closer than Central wouldn't hurt either. While her head is in the right place, its an out of touch article for sure. If you guys need a real article on the current state of Lark as opposed to this outside looking in perspective, do let me know. Yeah was up in Burlington recently....Church street was so crowded with people restaurants bars life etc......prefer booming rap music blaring from cars driving up and down Lark street! I like the idea of a greenway, but have a feeling it would never happen, chiefly from those who it would benefit the most from it: the residents. I can't agree more than current parking supply is sufficient, but could be better marketed and the city/BID or local business need to do a better job coordinating what is there. I do more walking getting from my car and navigating our fun houses, I mean malls, than I do getting from point A to point B on Lark, so I don't really buy the argument that we need more parking. We have a wonderful transit system, which I use to get from my corner of the city to Lark. Maybe some kind of incentive for those who bus it would be helpful, cutting down on Albany resident using up immediate parking that the suburbanites could use. I think there are some wonderful opportunities that can occur here, countless options have been listed in various comments on the subject the past few months. Have something fun and unique to draw folks here is key, not the parking. Most of my suburbanite friends don't bemoan the parking, but the lack of something "new" to go to. Hey folks, I see the parking thing has touched a nerve! Disagreement is more than welcome, but I'd encourage y'all to go out and do some reading before yelling at each other. Check out the pieces I linked to in the body of the article, as well as various works by Donald Shoup, the master in the field. His classic "The High Cost of Free Parking" is available here: http://www.uctc.net/research/papers/351.pdf. Maybe I'll write a followup just on that topic...I have hope the AOA commentariat can have an informed discussion! Also, to John Gentile above: if you'd bothered to read my previous article, you'd know I live a block away from Lark Street. For what it's worth, I even own a car! Also I'm a dude, but that's completely unimportant. Please try not to make assumptions; they make your argument weaker. First it was "hipness" now it's "urbanity!" Oh brother...where's the substance in this article? Where are the solutions you promise? Your first point about urbanity literally means nothing. Who should embrace it? Why...as in what's their incentive to? Because YOU said so? Not everything is run like government. People do things for business reasons. Your assessment of parking also leaves a lot to be desired. Who is "someone" and why should they take on this "brokered" task? What is their incentive and where are these 500-600 space anyway?! When's the last time you saw a car park in center square! They're all much farther than you make it seem. If you're going to increase foot traffic (which has almost nothing to do with snow removal and everything to do with people's desire to stop their cars there) then people will have to have MORE parking or people are not going to drive there in the first place. And the businesses renting storefronts on Lark have not failed because of changes to business model. They've failed because nobody walks there during the day and only on their way to bars at night, because of the screwed up way Empire State plaza restricts traffic across the entire city and for the same reasons those businesses continue to fail on Pearl St. And I don't understand your point about zoning. Zoning matters for new construction but you don't have any vacant lots on Lark. Current property owners will just continue to operate under pre-existing non-conforming zoning as long as their CO allows mixed use. In other words, you'll still have the same buildings with the same storefronts. The problem isn't infrastructure...the problem is the city. Right on about the need for creative and flexible parking solutions! There is quite a bit of parking in the area that could be unlocked by a collaborative effort by lot owners/BID/City. I've lived in Center Square for years and I have accepted the fact that I cannot expect to park in front of my apartment everyday. If I have a bunch of stuff to unload I just turn on my flashers, and then find some distant parking spot. The thing is, I enjoy my walk from wherever I park to my apartment. Emphasizing the pedestrian friendliness of the place is a great idea. I think Sandy is very much in touch with the status of the pedestrian infrastructure and parking issues in neighborhood he lives in. I think that the previous poster is a little too focused on cars and accessibility. What we have is a nice place that was built before cars were invented. The tight blocks and uninterrupted rows of houses that draw people to the neighborhood exist because the needs of the automobile weren't prioritized over that of the pedestrian. I would enjoy to hear John Gentile's perspective on Lark Street. Dialogue is a good thing. John Gentile, a lot of the street changes in NYC have improved retail sales far exceeding the rest of the neighborhood. In an area like Lark, chances of getting a parking spot right in front of your destination are slim, so, like it or not, everyone will be a pedestrian on Lark, regardless of how they get there. Dirk, free parking is incredibly expensive. Millions of dollars to build, more to maintain, more to manage the traffic that it will attract. It will destroy the buildings and jobs on the land it takes up. It will weaken an already stressed city government by replacing revenue-producing businesses with costs. No, free parking is never free. The zoning map is the real issue. If the Lark corridor between Madison and Washington/Central were entirely re-zoned for mixed use, more storefronts would likely be occupied because every new business/restaurant/bar wouldn't need a zoning waiver and the "neighborhood groups" that seek to block new development would have less of a leg to stand on. This would allow for easier turnover of store fronts and less vacant ones. 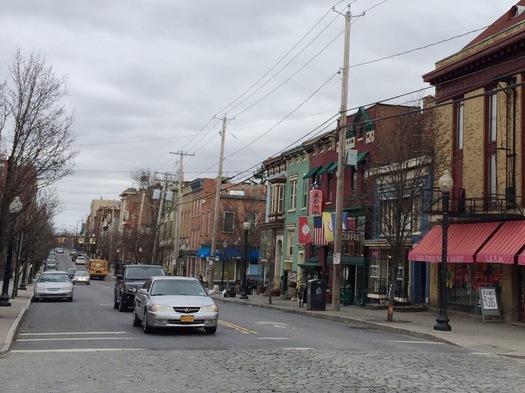 It would also allow for some real entrepreneurial development like we've seen in downtown Troy. This will also serve to redevelop some of the blighted "residential" buildings on Lark street itself into renovated apartments or office spaces.I could envision small offices, studios, medical offices, shops, and maybe even a small deli or two along this stretch if the right zoning is put in place and some incentives are given by Lark BID to bring folks in. After that is accomplished, the next step is to add some extra cross walks at Jay and Chestnut, and possibly re-work the parking system in Washington Park to increase people's ability to park and walk down to Lark and add a little extra pedestrian friendliness. That's the right idea GJ. Little steps like those aren't difficult and make a world of difference. Thank you to Anthony for sharing that pedestrian mall report. It was actually really interesting! In particular, it notes that Jay Street is Schenectady is one of the few exceptions to the failure stats you pointed out. John Gentile: I sort of agree on the permitting system, should be 24 hours (really only works for those who work night or early morning shifts) to really help residents. As an urbanite who does so in order to ditch the car, I donâ€™t believe residents should have pull up parking, but Iâ€™d compromise and say they should be able to at least park within a block of their house (not several blocks away as ardent urbanist or suburban state workers feel residents should have to suffer with because â€œthey chose to live there!â€). All of the evidence in NYC, elsewhere in the nation/world shows that pedestrian friendly design works well. Yes a pedestrian plaza isnâ€™t warranted everywhere (and I donâ€™t think there should be one on Lark, but in those areas where it makes sense, like in NYC, have been a huge boon to businesses), but more cross-walks/curb bump outs/pedestrian medians, better traffic signaling to give pedestrians a fighting chance (and more often than not, to streamline the flow for vehicles too), and focus on public transit friendly infrastructure pays dividends for local business, and as importantly, the residents. Michael: Zoning applies to everything, not just construction, but any new development a entrepreneur may want to undertake within existing infrastructure. 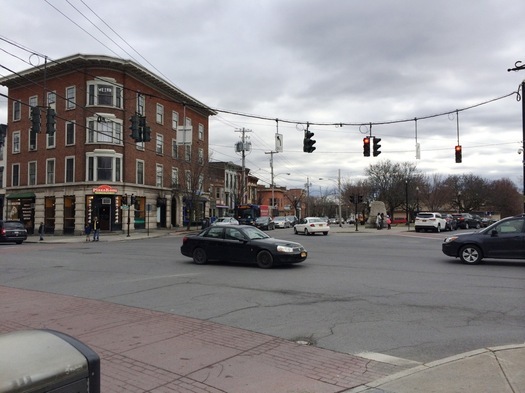 I believe this is why Troy and Schenectady are seeing some enterprising retail/commercial options, because their zoning is more nimble than Albanyâ€™s. The new zoning initiative should make it easier for more mix used retail to emerge along this stretch (currently, most buildings are zoned either residential, and if commercial options are available, they are limited to the ground floor). God bless those few business along Lark who had to go through heaven and earth to counter outdated zoning policy on this corridor in order to have a second floor commercial establishment or carve out a commercial enterprise in a building zoned residential. 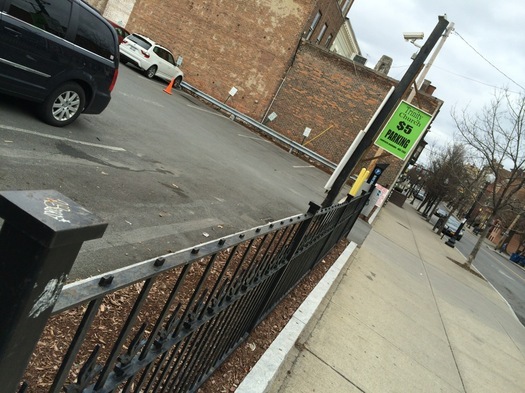 And to parkingâ€¦zoning influence parking minimums, the style of parking infrastructure, etc. so zoning IS an essential ingredient to figuring out the parking management solutions for the Lark Corridor. I maintain that parking is sufficient, but could be more effectively managed and advertised. Increasing the pedestrian friendliness of this stretch would certainly help attract more folks, especially during the day (many of my colleagues donâ€™t venture this far up from the ESP because they are afraid getting hit due to weak pedestrian safety or enforcement of pedestrian rightsâ€”than again, they are mostly suburbanites and their own shadow following them along Lark would scare them). Incentives to reward those using transit and freeing up existing parking space for others, should be explored. And most importantly, offer something new, fresh and dynamic. I think the NYIMBISM on this stretch that wants to keep it residential has scared off a lot of good opportunities that would have drawn folks in. Most people I talk to on the subject donâ€™t really mind the parking issues at Lark, they just want something worth going to if they are going to spend 10-20 minutes parking and walking to a venue. Thatâ€™s where the local businesses, definitely the city, and other interested parties need to step up and explore what this could look like. I think parking is the convenient excuse to not do the hard work in growing some exciting opportunities on this corridor. Rich, do you mind showing your $1300/year parking math? I thought the Lark Street redevelopment project was to include putting the utilities underground. Those poles and and wires are hideous. @Mike, darn, I threw that napkin out. Like parking, data assessment doesnâ€™t come free. Since I make about $28/hr and spent about an hour and half on this, letâ€™s just call it a flat $40 fee for the â€œshow me your workâ€ request. Iâ€™m just messing, always happy to help inform these insightful conversations. Here is my math original math, plus my revised analysis to dive deeper. Thanks for the prod, because my original assessment going off of an aggregate average, irrespective of parking space type, doesnâ€™t give policy planners (or citizens) enough info to make an informed decision. Hopefully, this will paint a better picture of the costs of parking and what it would take to expand options or move towards a â€œfee-lessâ€ system. A few qualifiers: 1) This was off of a three year average (2013-2015), which it appears their projected 2016 budget is also based off of. Some years itâ€™s a bit less, some years a bit more (Iâ€™d wager this is probably driven by snow removal costs and unplanned maintenance costs that caused the budget to come under some years and over others); 2) My original average is driven by dividing the number of spaces (5024) against the budget. As most astute urban planners know, costs vary by lot type: a garage costs far more in maintenance than a metered space (and for that matter the upfront costs are significantly different: one space in garage cost on average $20,000 to build while a metered space on the roadside or lot is closer to $3,000 to build); meanwhile, parking enforcement costs more for metered spaces (lot of ground to cover) than a garage (typically has built in features to keep out the cheaters). For my original exercise, I was just looking to get a ball park average, for it appears pro-parking forces seem to favor a range of parking options for this corridor. However, since you inquired, Iâ€™ve done a deeper dive to get a more precise number based off of space type. Fortunately, maintenance costs were segregated in the budget by space; unfortunately, enforcement was not. Therefore, I pro-rated enforcement costs across each space type based off of the percentage administrative costs were budgeted out by like type. End of the day, pretty good numbers, but still a bit squishy. Enjoy! Rich, things are a bit more interesting, if you ask me. How much of the costs are related to fee collection? Hint: there are 8 full-time management positions (9-th is currently open) per those 5000 spaces. In other word, each space gets 4 minutes of managers time a week. My bet is that this is mostly fee collection and issuing passes - which may require a few minutes a month per customer. Once you don't need all the collection work, sounds you have only a fraction of cost for the surface lot, for things like snow removal. Garage is a more interesting story due to capital and maintenance costs. Although, still I doubt we're talking hundreds a year. Would be interesting to look at cost of land and pavement and taxes & maintenance for low side estimate. How can folks in the area get involved to promote these ideas?